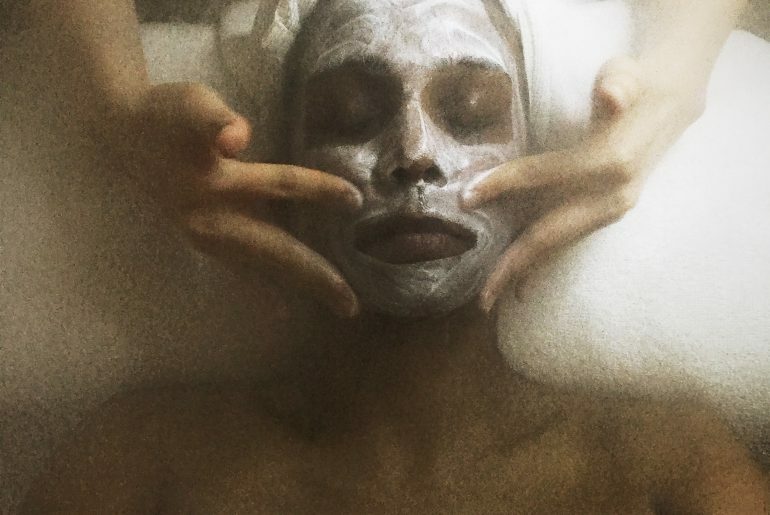 Thinking of getting a facial anytime soon? Not sure where to go and which facial to get? I get it. We’re women and we’re spoilt for choice. The last place was great but our skin needs a new boost. I was in the same predicament not too long ago so I decided to take a chance on SkinLab. Initially I was worried about the hard sell tactics I would have to face but a ‘glow’ was long overdue and I was willing to face anything. No pun intended. 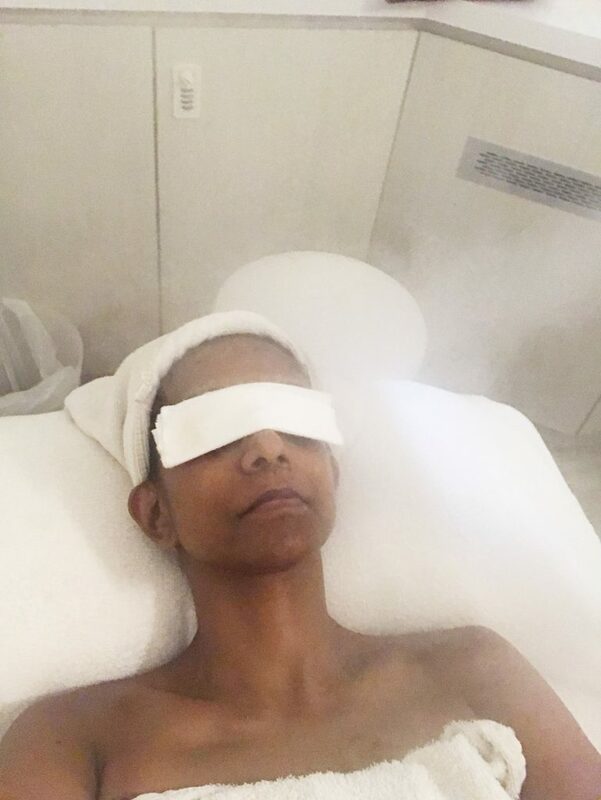 My facial was scheduled on a Thursday afternoon which was perfect for me. When I arrived, there was some confusion but thankfully it was resolved quickly and soon after I was brought into my treatment room . I liked that there was no pushing for me to get any add-ons before we got the started. The sweetest beautician attended to me. She ran through the available promotional options and recommended the Gentle Milk Peel which is a mild peeling system is designed to help you achieve clearer, brighter and smoother skin, easily and effectively. It utilises lactic acid, a gentle alpha hydroxy acid (AHA) derived from milk and fruits. Lactic acid is one of the gentlest AHAs around and is generally well-tolerated by most skin types, even sensitive skin conditions such as eczema and rosacea. As a humectant, lactic acid does not dry the skin like other AHAs. With a strict doctor-developed protocol, professionally trained therapists and consultants, our Gentle Milk Peel can safely lighten skin dullness, remove dead skin cells and moisturise skin. Their consultants will take the time to discuss whether your goals and expectations for the treatment are realistic, and also discuss with you all our Gentle Milk Peel benefits and risks. 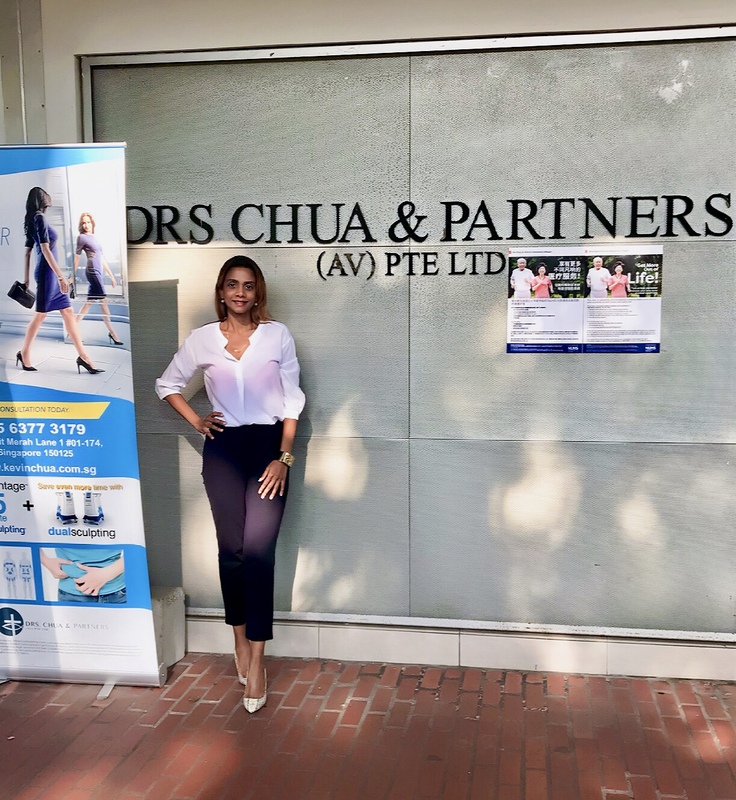 I heard about Drs Chua and Partners recently and I wanted to check out the various treatments their clinic provided as I am all about skincare. 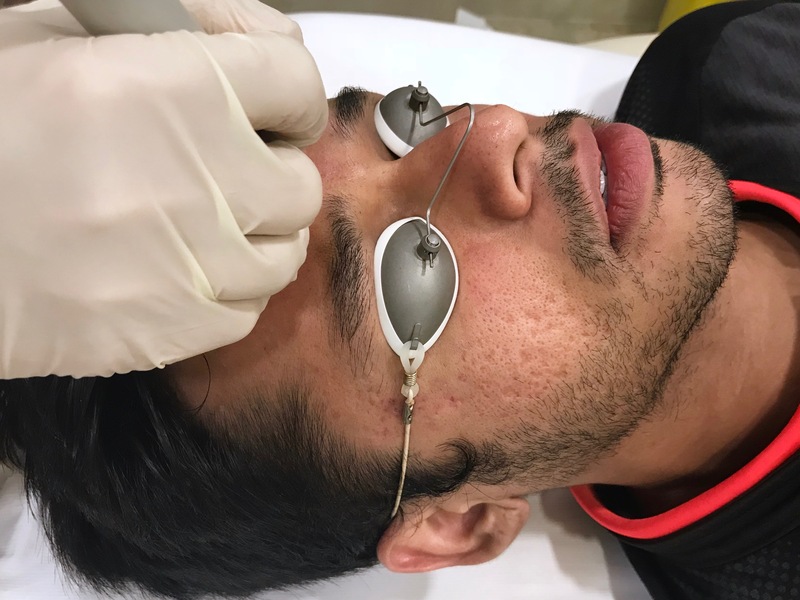 They are one of the few clinics in Singapore who have the PicoWay laser treatment available and what better place to undergo such a treatment than with a clinic. 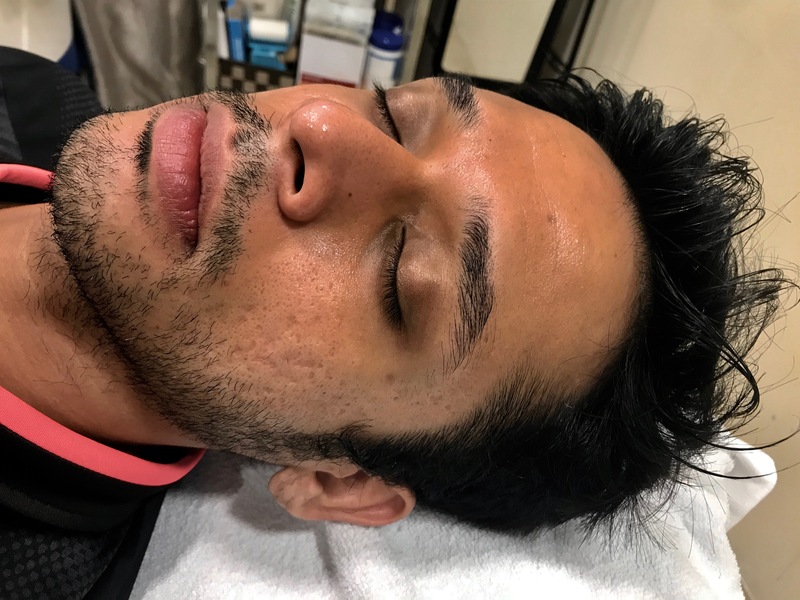 When I arrived with my colleague and friend Aiz, Dr Chua recommended that he try the PicoWay laser treatment for his prominent acne scars while I try the HydraFacial instead. Aiz has always wanted to treat his acne scars and this was the perfect opportunity for him to do so. 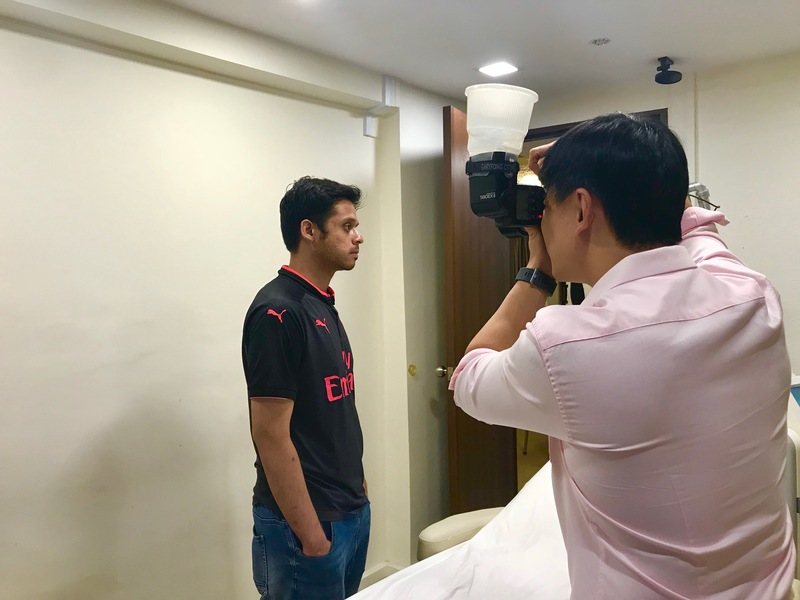 Dr Chua took some photos of Aiz before the treatment then briefed him thoroughly on what to expect during and after. Utilising a unique technology where the laser pulses are delivered in picoseconds (one trillionth of a second), PicoWay treatments deliver small bursts of laser energy that penetrates deep into the skin. This not only stimulates the body’s healing response but also breaks up pigmentation in a speedy and efficient manner. PicoWay has three main benefits: it enables the removal of multi-coloured and recalcitrant tattoos, works to remove benign pigmented lesions, and helps to treat skin irregularities. PicoWay helps to stimulate the skin’s repair mechanism while jumpstarting collagen production in order to heal the skin and increase tissue elasticity. Beverly Hills-based Dr Harold Lancer and dermatologist to renowned celebrities has even used it on personalities such as Nicole Richie, Beyonce, Kim Kardashian and Scarlett Johansson to great effects. Studies have shown that PicoWay’s short pulse delivery means that less energy is used, resulting in less heat being emitted during the treatment, thereby allowing for quicker recovery times. 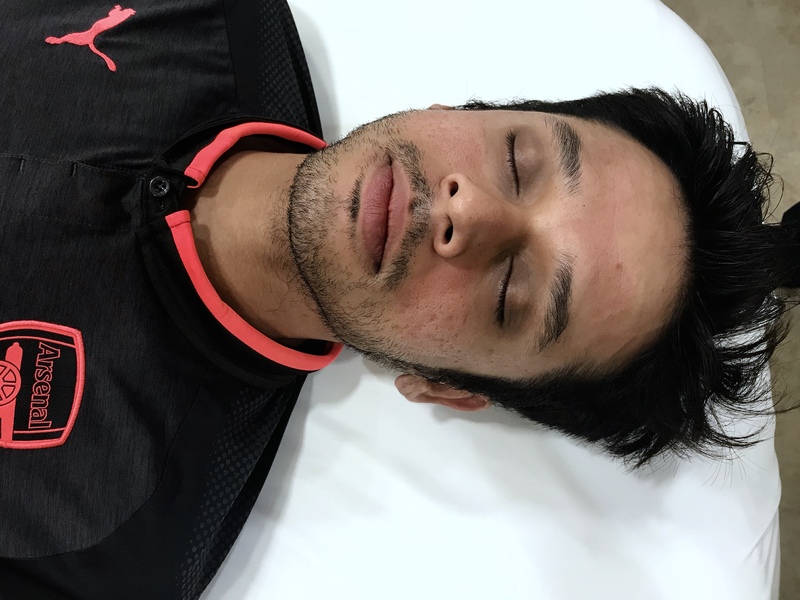 The treatment is thus more comfortable than traditional lasers and is suitable for most skin types. Clients who may be interested in this treatment include those looking for the most painless tattoo or pigmentation removal solution out there or anyone looking for an anti-aging treatment with minimal risk and discomfort. Mild redness can be expected immediately after treatment. A calming cream will be applied along with a chemical-free sunblock to the treated area to soothe and protect the skin. “We decided to introduce the PicoWay laser into our clinic’s portfolio because it is the next frontier in laser technology. Its picosecond pulse enables faster clearance of tattoos and pigments as well as skin rejuvenation in only a few treatments. 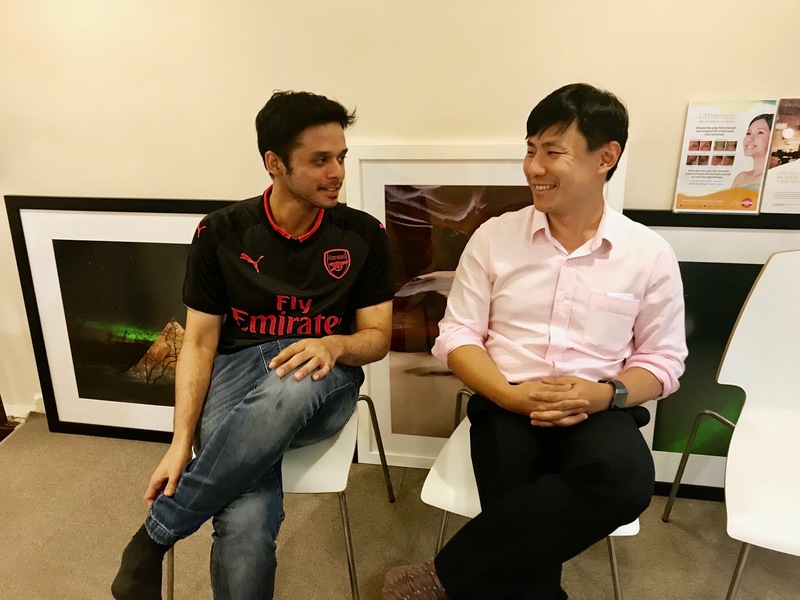 It is truly an effective yet comfortable laser that looks set to become the leading laser treatment in the industry,” said Dr Chua about bringing PicoWay into his clinic. Drs Chua & Partners is a family clinic with a special interest in aesthetics and tattoo removal. Located conveniently in the Bukit Merah heartlands, signature treatments at the clinic include PicoWay, CoolSculptingTM and HydraFacialTM. 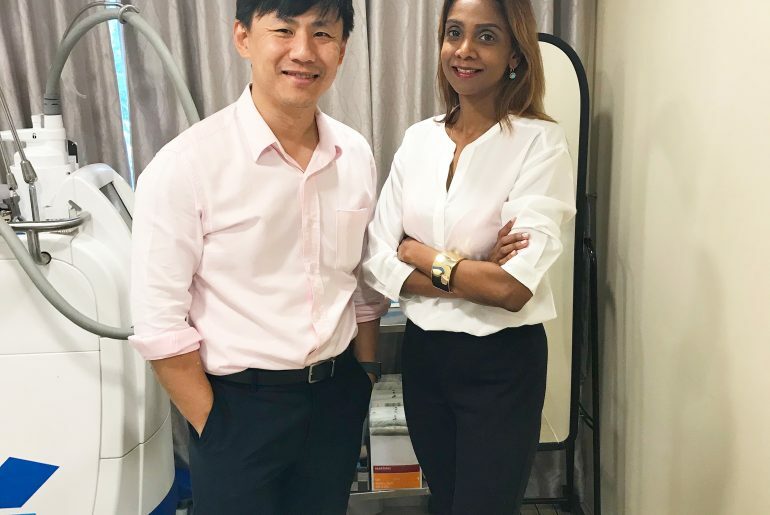 Helmed by Dr Kevin Chua and his wife Dr Iroshini Chua, the clinic also has its own line of cosmeceutical products called Dr Kevin Chua Aesthetics. For more information, please visit kevinchua.com.sg. The Tatinis Art Show returned this June at the F1 Pit Building. Showcasing both local and international artists. The 3 day event offered a diverse selection of contemporary artworks across a variety of styles and mediums including paintings, sculpture, and photography. 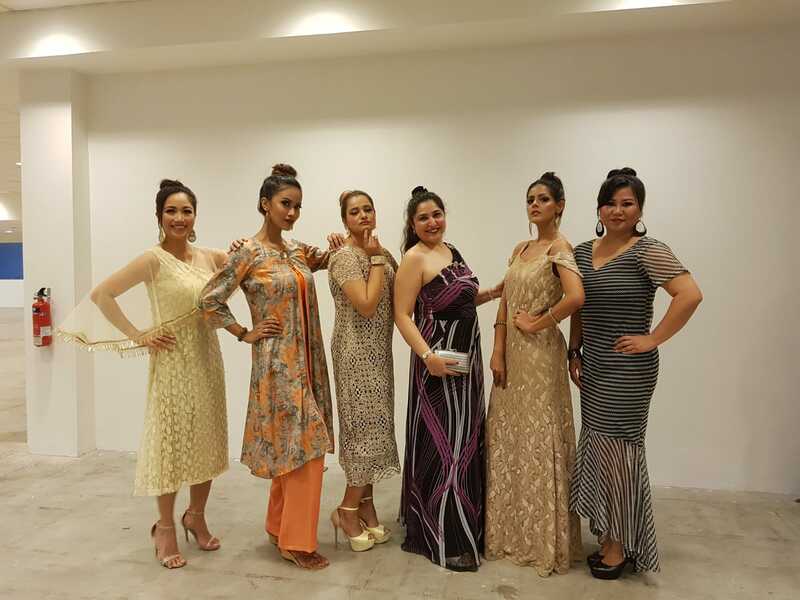 Several special sessions also enticed and entertained the masses including a “Fashion Meets Art” segment. My favourite pick of the night was the runway show featuring gorgeous dresses and jewelry by none other than Evanna Fashion House. for piloting multiple successful brands such as “Agragrami”,” “Bohemian Jewellery”, ”Rent amenity” and their eco fashion brand – “Mikhadi”. Her versatile designs cater to both men and women. She creates clothes for strong women and men who are not afraid to be successful, and who are not afraid to fail. After all, success is a journey, not a destination. means go out of trend. and the label became renowned. Agragrami clothes are very feminine, and they flatter the female silhouette. and they keep this as one of their key services. LET YOUR SCENT SPEAK VOLUMES! I’m not a diamonds and pearls girl. I’m not even a bags girl but I do know and love my fragrances. My love for perfumes began with my maternal grandmother who smelled like roses, thanks to the Charlie fragrance she always had on. Hence my strong appreciation for floral scents. Fragrances do for me what Hermes bags or 20 carat diamond rings do for most women. I love it when I walk into a room and get asked what perfume I’m wearing. I especially love it when I’m told I smell lovely. It gives me a major boost and puts me in the perfect mood each time. I stumbled upon Good Girl by Carolina Herrera as I was walking through the Mall of the Emirates in Dubai. A salesgirl walked up to me and gave me a whiff. Usually I’m not one to buy a bottle of perfume recommended to me by a salesperson. What I normally do is go online and check out top 10 fragrances of the year and then I go to the store and test them all out before I make the purchase. But it was different with Good Girl. I was sold on the spot. It’s an everyday perfume for the good girl who knows how to be bad (ME). The smell of white Sambac jasmine and tuberose in contrast with the mysterious notes of tonka bean and cocoa are just so inviting to say no to. 1. Don’t cover your perfume up with your clothing. 2. Sweat can destroy your scent faster than you’d like. 3. Don’t RUB, just spray! 4. Apply perfume on your HAIR. It sticks and stays on longer. 5. Moisturise before applying. Smooth and soft skin lock the scent in better. 6. Spray 5 to 7 inches away for best results. 8. OWN your scent. Wear it like a rock star!!! With the new year comes being a year older and with that comes a certain level of anxiety. While it may not mean much when you’re 18 or 25, it starts to have more of an impact once you hit 35 AND you’re a woman. I hate admitting it but I’ve found freedom in verbalizing my fears, one of them being the woes of aging. I truly dread the day my wrinkles start to show and my skin starts to sag. I won’t make any apology for sounding superficial because you & I both know that we all have the same fear even if we differ in our approach to addressing it. It’s there. It exist. I know of some who decide to go on and on about growing old and the ailments that come with it. I know of some who truly believe that age is just a number and act whichever number they resonate with most. And then there’s ME. I fall somewhere in between, where I’ve come to accept that I am getting older yet I still haven’t found the need to turn into a granny just yet. I am on a mission to look as young as I can for as long as I can and if you are too, then follow me. So what do I do now that it’s 2018 and I’ve about to turn (not telling you)? I use whatever anti-aging weapons that are available to me. My favourite weapon TODAY being the SkinCeuticals Phloretin CF Serum. You may wonder how my relationship with SkinCeuticals began. Well, here’s the short version. I’d been using Clarins, Lancome, Kiehls, Loccitane, Avene, just to name a few, eons ago. And while all these products have done me well, SkinCeuticals blew em all out the water. I have dark skin and although that comes with certain benefits, most of us tend to have hyperpgimentation, uneven skintones, light coloured patches here and there and dark patches on our chins etc. And unlike women with light skin, we aren’t spoilt for choice in the cosmetics department. Covering up our flaws while maintaining a radiant glow is an arduous task. Most of us tend to look grey even with colour correctors and bronzers. And this is exactly the reason why focussing on SKINCARE, as opposed to the best concealor in the market, is key. Think about it this way. Even if we did master the art of perfect makeup for our skintone, we’d still be miserable when the foundations, blushers and powders come off. Which woman does not mind looking bad without her makeup on? NONE! I like to see my skin looking bright and my skintone even, when my makeup’s off. I love not having to hate looking in the mirror at night before I go to bed or in the morning when I wake up. Hence my search for the perfect serum began from the moment I turned 35. Through all that filtering, googling, shopping, speaking to beauticians and skin therapists, I learned that Vitamin C is a superstar for its proven antioxidant properties and that a good serum with vitamin C will make all the difference. Hence I was fortunate to finally find and fall in love with SKINCEUTICALS PHLORETIN CF 7 months ago. My skin has become visibly more even, supple and certainly younger looking. Dolling myself up takes less effort and the BEST part, I can now leave the house with practically nothing on my face and still be told I have great skin!!! A friend once said to me that when you have something good in hand, the right thing to do is to share it. So I’ve decided to share this remarkable find with you. 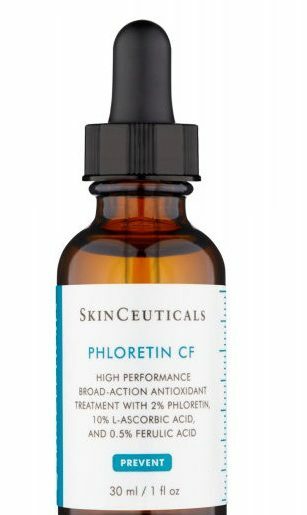 Protect and transform your skin with SkinCeuticals Phloretin CF, a daytime face serum with antioxidant Vitamin C to help keep skin safe from damaging environmental factors. Working to protect skin while diminishing the appearance of fine lines and discoloration, the serum melts effortlessly in, and once absorbed, will remain effective for a minimum of 72 hours. Utilizing a patented synergistic combination of 2% Phloretin, 10% Pure Vitamin C (L-Ascorbic Acid), and 0.5% Ferulic Acid, the formula delivers enhanced protection against atmospheric skin aging, such as UVA/UVB rays and ozone pollution, and will improve skin tone to promote a more even-looking complexion. Free from parabens, fragrance and dye. 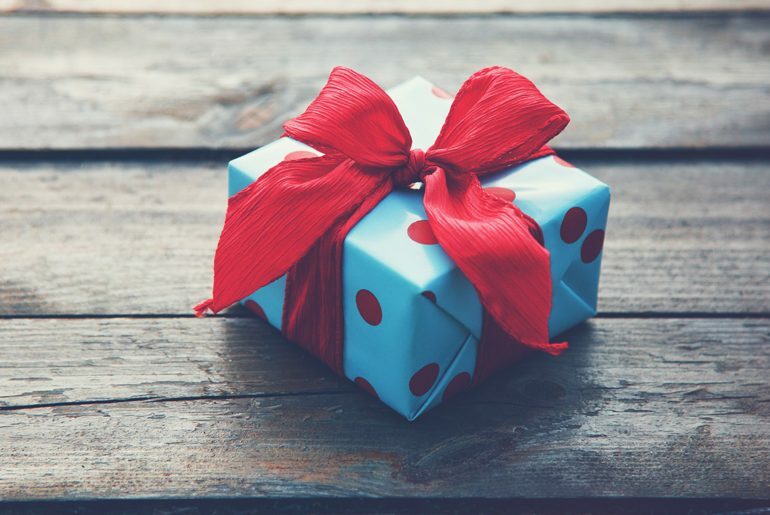 The best gift you can give yourself this holiday is the power to FORGIVE. Forgive everyone for everything, yourself included. Why? Because even one resentment, is one too many. I just got back from I consider the best trip one could have to Paris. 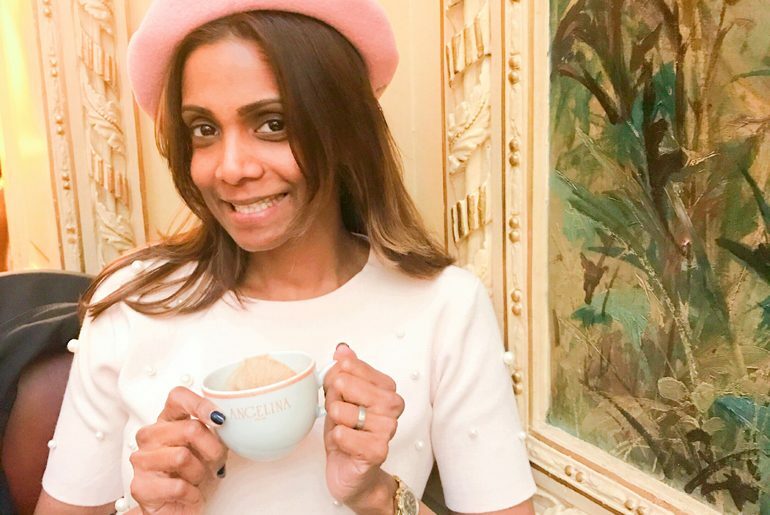 I did go to Paris for my honeymoon and it was the most romantic thing I’d ever done with my husband but this trip was not about me discovering Paris, it was more about me LIVING Paris. The iconic foundation base by CHANEL, a cult favorite with professional makeup artists. Magical, it instantly illuminates the complexion with a subtle halo of light and perfectly evens out the skin’s texture. Being ignored is as enjoyable as being spat in the face or cursed at. No one likes to feel insignificant. It’s one thing to be treated badly but another to be ignored completely. I woke up today to a text from a friend informing me about an ADULT humiliating a youth on his Facebook page. 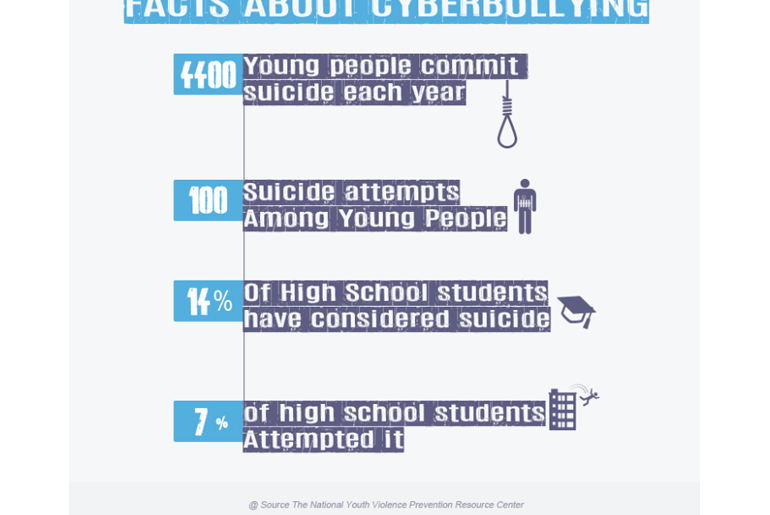 I don’t want to get into the details of the incident because I’d be calling Mr Big Bully out which would make me just like him, but I do what to talk about the Cyber-STUPID of the world.